I imagine the inquirer is picturing my family back home–casually rocking on the front porch while sipping sweet tea, nothing better to do than wait for the sun to set. And while the South is famous for porches and sweet tea, the “slow-living” stereotype is somewhat of a myth. People in the South are often just as inpatient, rushed and busy as people up North. Meet “Slowpoke.” He’s my reminder to slow down. Regardless of geography, it’s an individual decision how you are going to live. I’ve lived in small towns and been insanely busy, yet lived in large cities taking it slow and simple. Sure, there are factors that cause more stress in larger towns–traffic, cost of living, etc. 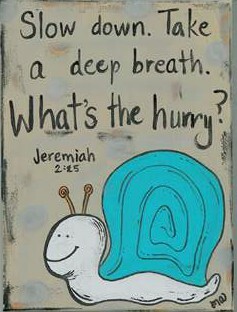 But the truth is each of us has to make a personal choice to slow down. Even with a packed schedule, you can have a stillness inside your soul that refuses to buy into a culture that reeks of stress. 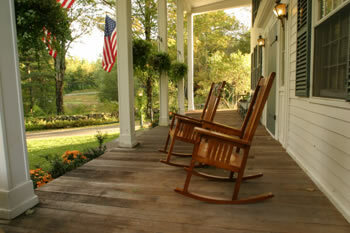 I dare you to stop dreaming about the day you’ll sit and sip sweet tea on a porch, and slow down where you are. This morning I gave my 2 year old a half-full cup of chocolate milk. Somehow I didn’t foresee this ending badly. No more than 3 minutes after receiving the drink I hear Benjamin say, “Oooohhhhh. I make mess.” I came in to find the entire contents splattered across the floor–the floor of my in-laws beautiful beach condo. There was absolutely nothing to do but take a deep breath and grab a roll of paper towels. I knew this outcome was possible when I handed the drink over to a feeble-handed toddler. But I made the choice anyway, and now it was time to pay the price for my decision. As I glanced down at the spill I noticed the pattern was actually a great life-lesson. 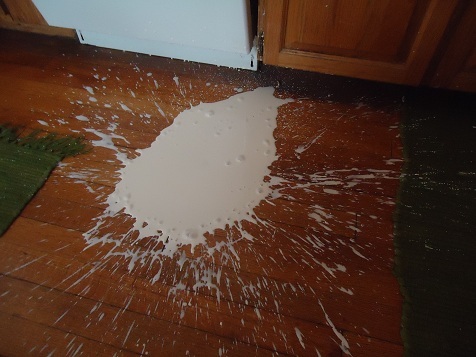 There’s the obvious centrally located mess–the area where the cup landed and the majority of the milk collected. But feet beyond that, the mess extended to the smallest of droplets, and even these tiny sticky specks have potential to cause problems if left unattended. When you make a mistake, the damage isn’t confined to you and you alone. An unwise decision made in haste, a word spoken harshly, or a careless action. Look closely, people and things around you get splattered and careful clean-up is necessary. When our words or actions lead to a mess, cleaning up that mess is the right thing to do. A responsible person recognizes their fault and how it affects people and things around them. A loving person finds ways to repair and restore whatever damage–no matter how large or small–occurred. God hasn’t called us to a life of carelessness, but of self-control and sound mind. Paying careful attention to the full extent of the spill is necessary when cleaning up chocolate milk, and any mess in life. God also didn’t call us to a life of fear, shame and guilt. Which is why once the spill is clean, it’s clean. Glory to God!